For me, vegetables used to be an afterthought to my meal where I would just throw in a few baby carrots to eat with lunch, or have a side salad with dinner. With all of the health benefits linked to a high- vegetable diet, vegetables should be taking the center stage at mealtime. A delicious way to incorporate fresh vegetables as a main dish is with a Mediterranean Three Bean Salad. 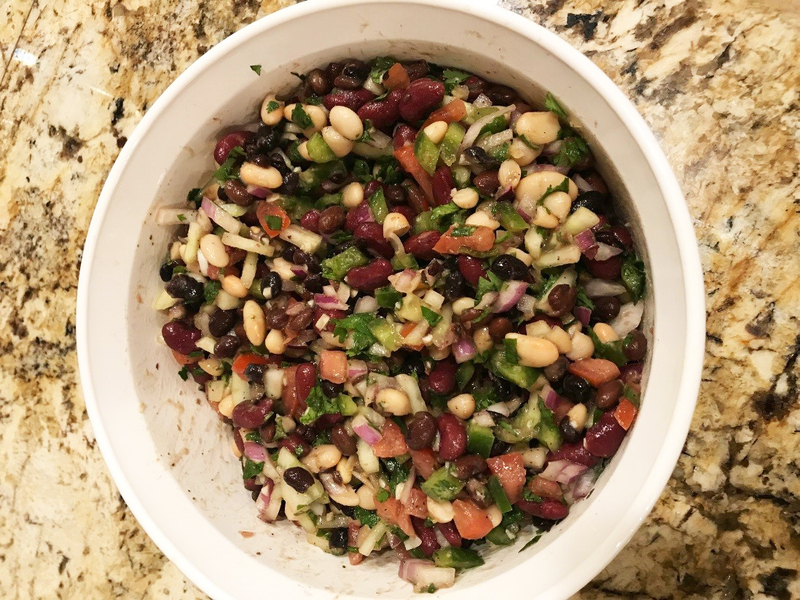 Not only does this colorful bean salad include a variety of fresh vegetables, but it is also a great source of protein. Add in a fruit salad with strawberries, blueberries, and blackberries as a side and you have a light and nutritious summertime meal. An added bonus to this type of meal is that many of the ingredients are in season during the summer months which will enhance the flavor. Check out this blog post for more tips on buying in-season produce. Combine kidney beans, Great Northern beans, black beans, corn, tomato, onion, green pepper, cucumber, and parsley in a large bowl. Mix well. In a separate small bowl, whisk together lemon juice, olive oil, red wine vinegar, garlic, cumin, salt and pepper to taste.